“One of my happiest moments, one that really makes my day, is when I can get out of a parking spot without the parking attendant [the sayes, plural soyas] noticing me. Though it is only LE5 or LE10 which I save, it makes me as happy as if I had made it through a robbery,” Ahmed Samir, a Cairo resident, told Al-Ahram Weekly. Samir, a 38-year-old accountant, said he worked in the jam-packed Mohandessin district of Cairo in which he has to deal with a sayes on a daily basis. “My work doesn’t have parking spaces, and so I pay around LE150 to LE200 per month to the sayes to take care of things for me, but frankly it is not his right to take the money. He doesn’t deserve it because he does nothing, and anyway it isn’t really a job —it’s more a form of blackmail,” Samir said. 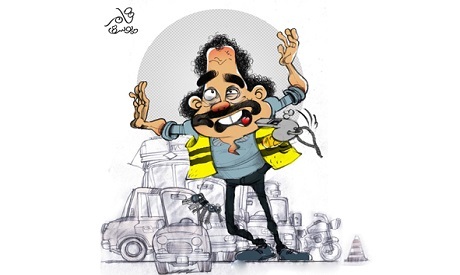 Few Cairo drivers have not been psychologically or financially abused by a sayes, who — in the best of cases —directs them to a good parking spot or assists them in getting out of a parking spot in a crowded street, or — in the worst of cases — just stands there implying that he owns the street through his frantic hand gestures. Though the sayes phenomenon has become a normal one in many of Cairo’s bustling neighbourhoods, the fees he asks for are not the same from one district to another or sometimes according to the car the sayes takes charge of. In some cases, they can exceed LE30. Islam Essam, a 35-year-old salesperson, deals with a sayes every day when he drives his car. “I was once with my wife and her sister on a stroll in the Al-Hussein area of Cairo where one rarely finds a parking spot. And out of nowhere a sayes appeared and asked me to leave the car keys and pay LE30 in advance for his services. I refused to leave the keys and parked the car myself and told him I would pay when I came back,” Essam said. Later, when he came back, the sayes began to show some roughness, probably wanting to “make me fear his bullying especially because I was accompanied by two women,” Essam said. “I told him I would only pay LE10, which he didn’t accept and began to bang violently on the windshield of the car. I got out of the car and started a fight with him and my wife rushed to call a nearby policeman who let me go without paying a pound,” Essam added. “They [the parking attendants] claim to be working, but in fact they are unfairly taking our money. Some of them are little better than thugs,” he said. Noha Ismail, 40, says she hardly ever finds a parking spot in Cairo without seeing a sayes standing next to it. “They are proliferating, and their number increases every day. They have become one of the most annoying features of Cairo’s streets. For me, they are not providing a service but only making me feel tense when parking my car. Their voices disturb me even if they are supposed to be giving me instructions to help me park,” Ismail said. Marwa Fouad, 27, said she only pays the sayes to avoid his harassing her. “He [the sayes] is useless,” Fouad said. “He not only distracts me when I am trying to park the car, but he also frightens me. I refuse to leave my car keys with an unknown sayes, and I would only do so to valets in certain parking areas. I only pay parking fees when I meet a sayes to avoid harassment and intimidation,” she said. The disruption of the sayes is not a problem for Mustafa Imam, 29, however, who said he can ignore such annoying guidance. “My problem is when I park my car myself with no sayes, and then he appears from nowhere in front of the car when I am driving, saying ‘Happy New Year,’ which has no meaning but is only an indication that he is asking for some money,” Imam said. As a result of complaints about the growing phenomenon of the sayes in the streets of the capital, the Ministry of Interior has recently launched an initiative asking people to report any they see and not to pay a single pound. It has urged people to call a hotline at 136 to report such incidents and simply to walk away from them. Although dealing with a sayes can be mentally and financially exhausting for almost all drivers, some believe they are useful. Sally, a 21-year-old university student, said that a sayes could be useful for new drivers. “I just got my driving licence, and I depend on a sayes to park the car,” Sally said. “I know that he is annoying to some, but in my case he is useful and he deserves the money he asks for,” she said. Amany Abdel-Halim, a 45-year-old employee, agreed about the usefulness of her sayes. “I leave my car for eight hours every day during my work, and thanks to the sayes it is kept safe. Sometimes I arrive at work just on time, and I have no time to search for a parking spot so I leave the car and the key with him to let him park it,” Abdel-Halim said. Mohamed Yassin also said he thought a sayes could sometimes be useful because “he makes a parking spot exist from nowhere, pushing and pulling other parked cars.” This could be extremely useful, especially in rush hours, Yassin said. In a country where the number of vehicles reached almost 10 million — 2.5 million in Cairo — by the end of 2017, according to the Central Agency for Public Mobilisation and Statistics (CAPMAS), finding a parking spot has become a daily struggle for many. This could be part of the story behind the spread of the sayes, according to specialists, though there are also social and economic reasons behind the phenomenon. Samia Khedr, a sociology professor at Ain Shams University in Cairo, said that one reason behind the phenomenon was that “there is chaos in Egypt’s streets.” “One of the characteristics of this chaos was when the administration of each governorate allowed landowners to demolish villas and small residential buildings and construct residential towers instead without enough parking spaces to accommodate such a number of flats or people,” she said. “The street may have been hosting four cars related to the villa, but that number becomes at least 40 for a residential tower,” Khedr told the Weekly. “There is no concern for harmony and planning when the governorate allows commercial activities to open in such residential towers, like shops, banks and cafes with no parking areas dedicated to them. From here comes congestion, with the increasing number of cars leading naturally to the emergence of someone who helps drivers to park. The latter then become compelled to deal with him [the sayes] to guard the car or protect them from traffic fines as a result of parking in prohibited spots,” she said. Egypt’s unemployment rate is currently 9.9 per cent and illiteracy was around 25 per cent in 2017, according to CAPMAS. Rural illiteracy rates stand at around 32.2 per cent, whereas in urban areas they are 17.7 per cent. Khedr said that increased migration from rural areas to the cities had aggravated the problem. “Residents of Upper Egypt and rural areas migrate to Cairo in search of work. Given that they are unemployed and the majority of them are uneducated, they can find no better job than working as a sayes,” she said, adding that this could explain the increase in numbers. Mahmoud, 56, has been working as a sayes for 25 years in downtown Cairo. “I have no other daily income. I have four handicapped children. I don’t work to increase my other income because this is my only source of income,” Mahmoud told the Weekly. Regarding complaints by drivers about dealing with a sayes, with some describing them as “thugs”, Mahmoud replied that “they [the drivers] could be right. A large percentage are rude and greedy. They are not satisfied with LE5 and often ask for more. I once was parking my motorcycle in the Attaba district, and the sayes there asked me to pay LE10,” Mahmoud said, adding that he had refused to pay. Amr Mohamed, 28, has been working as a sayes since he was 16 years old. “I inherited this profession from my father. I have three children, and I pay for my mother’s medical treatment because she has no pension due to my father’s job. I am uneducated, and this is the only work I can do,” Mohamed said. He frowned when faced by drivers’ complaints, saying that “I provide parking spots and parking guidance, and I protect cars. In return, I request a little money for my services,” he said. “How could I be a thug when I am protecting their cars? Moreover, the police know exactly who we are and have our IDs with them,” he added. Ismail, a 50-year-old sayes who works in Mohandessin, said that fees could be imposed for parking or even acts of sabotage in case of the refusal of a driver. “Such individual acts have made some drivers describe us as thugs, but this does not represent us all,” Ismail said. Said, 40, is from the Upper Egyptian governorate of Qena and originally migrated to Cairo with his family to work in a security post but instead became a sayes in the Dokki district. “Because I am responsible for a family of four, I had to look for work following the security company’s rejecting me. I first worked as a doorman in one of the Dokki residential buildings and then gradually began to wash the cars in front of the building and organise parking. Then I began to sling a yellow towel over my shoulder and put a whistle round my neck to become a sayes for half of the buildings in the street,” Said said, adding that he earned around LE80 per day. Elsewhere in the Nasr City district, Gamal, 46, works as a sayes at night and a security guard in the morning in one of the nearby companies. “In the light of the poor economic conditions and the high cost of living, I had to search for additional jobs to increase my LE1,800 salary as I have two children,” Gamal said. In response to questions about how he chose the location and who determines prices, Gamal said that “on my way to work every day I noticed a place where a lot of cars were parked, and from there I got the idea, as nowadays there is a sayes in every corner. Simply because I felt as if I had no other choices, I didn’t hesitate to be a sayes,” Gamal said. “As for prices, each street in each neighbourhood has its own sayes who controls it, and he determines the price of each parking spot. In order to avoid being reported to the police, I first used to accept any amount of money, even it was just LE1 or LE2, but now I don’t accept less than LE5,” he said. Due to the increase in the number of people working as sayes with no law regulating the profession, MPs have begun to address the phenomenon to put an end to any bullying. In April, MP Mamdouh Maklad submitted a draft law regulating the work of the sayes, with this then being approved by parliament’s Local Administration Committee. Maklad said that the draft law aimed at organising parking lots in order to put an end to acts of bullying in the streets. This harmed the image of Egypt, he said, and as a result the law had had to step in. “Over recent years, the sayes has become a pest that harms the Egyptian state as well as citizens and tourists, especially because the sayes works outside state control. He may even carry out acts of thuggery, and therefore the new law has become a necessity,” Maklad told the Weekly. “The draft law was submitted earlier this year, and the Local Administration Committee approved it in April. Now it is pending final approval. Following the approval of the committee the draft was supposed to be discussed by the General Committee of the parliament, but because there were more urgent laws it was postponed to the new parliamentary session that starts in October,” Maklad said. The new law obliges the state to regulate parking spaces and the timing and pricing of fees. Maklad said it would require the issuance of working licences through tenders for private security companies operating in each neighbourhood. “It will lead to a win-win situation. The state will financially benefit from the tenders. The citizen will benefit from the new organisation of parking spots and avoiding the bullying of the sayes because his work will now be supervised. And finally the sayes himself will benefit from the legalisation of his work, and he will also enjoy a stable income and social insurance,” Maklad said. The law establishes a committee in each governorate to regulate the profession of the sayes and parking areas. A sayes must not be younger than 21 years of age, must know how to read and write, and must have a valid driver’s licence in order to enter the profession. In addition, he must have a health certificate issued by the forensic or central laboratories of the Ministry of Health, stating that he has not been using narcotic drugs, and he must have a clean criminal record. The draft law is a ray of hope for the sayes, almost all of whom have welcomed the draft as it will let them work in a safer atmosphere. “I agree to work under the law provided that it will not let others work in my parking area,” Mohamed, a sayes in downtown Cairo, said. “My source of income is threatened because I don’t work with a licence. The law will provide me with a legal identity,” Gamal said. However, Khedr believes that the law alone will not solve the phenomenon. “It is a complex problem with many reasons behind it, and relying on the law alone will address the effects of the problem not its causes. We must rely on more than one solution,” the sociology professor said. “There should be more efforts made to find practical solutions to reduce the unemployment rates in other governorates and consequently reduce migration rates. There should also be a greater awareness of the problems of population growth,” Khedr said.